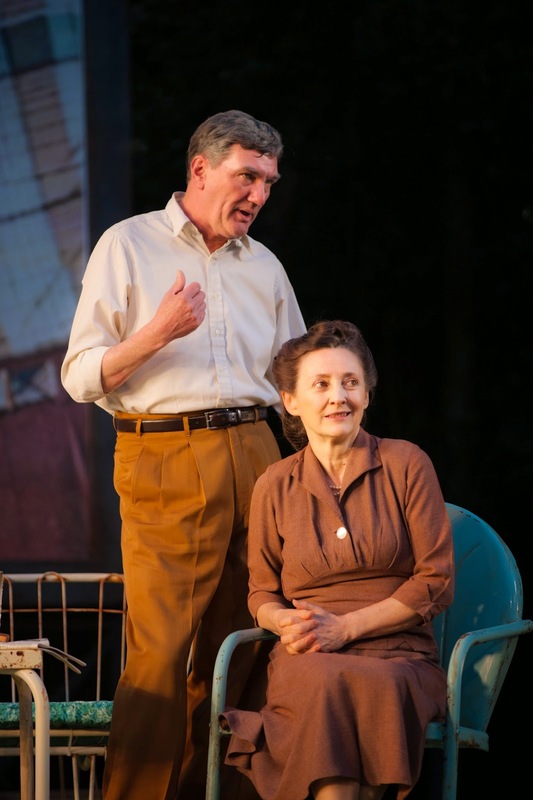 Challenging perceptions of right and wrong and forcing us to question personal choices, Arthur Miller’s All My Sons, his 20th century scorching classic on lies, deceit and integrity, is given a powerful revival by Timothy Sheader at the Open Air Theatre. The Regents Park setting suits the play, with Lizzie Clachan's simple set of a square lawn underpinned by long mangled roots being dominated by a huge Norman Rockwell image of a ‘perfect’ 1940’s post-war smiling family. The irony is profound. Tensions rise as we encounter the Keller family, seemingly close and still grappling with the loss of son Larry some three years after his death. Surviving son Chris sensitively portrayed by Charles Aitken wants to move on with his life but is thwarted by a mother who refuses to accept that Larry is dead and by his father Joe who doesn’t want to rock the boat. Chris seeks inspiration and something beautiful to come home to, whilst Joe (a finely tuned performance from Tom Mannion) just wants something tangible to pass on that will have marked his existance. But soaring around this family are guilty secrets and a history of hideous compromises. With a nod to Greek tragedy and a grim inevitability, Miller skilfully weaves the threads that will lead to Joe Keller’s destruction. This is a harrowing production of a devastating play. Brid Brennan’s powerful, intense matriarch Kate, grief stricken and in deep denial, tries to hold her family together as the overhead roar of Heathrow bound jet planes adds an unexpected layer of poignant pain to the events on stage. Powerful work too from Amy Nuttall as girlfriend Ann, harbouring her own devastating secret and also from Andy McKeane as her brother George. Nick Powell’s atmospheric music is ominous throughout, complementing Sheader’s interpretation, with the evening proving to be coruscating theatre. Effective productions of Miller should never be easy to watch and this production is as harrowing as it is brilliant.